This 100-Day Accountability Report gives a progress update on recommendations to reform Cook County that the Civic Federation made in its Cook County Modernization Report. The 100-Day Report provides an overview of key events in the transition to the new administration of Cook County Board President Toni Preckwinkle, summarizes key findings from the Modernization Report, provides an update on the County’s budget since publication of the original report and includes detailed information on the status of all 36 recommendations. The purpose of the Cook County Modernization Report is to provide leaders of the County with ideas for reshaping and refining County government that will improve service delivery to residents while reducing wasteful spending and decreasing reliance on taxpayer funds. What Does Cook County Do? With an estimated 5,287,037 residents, Cook County is the most populous county in the State of Illinois and the second most populous county in the United States, coming only after Los Angeles County in California. The County is 946 square miles in size – of that only 15% is unincorporated by the City of Chicago or other municipalities. The role of Cook County government is to provide healthcare, court and public safety services, as well as administer vital records and assess and collect property taxes. In 2009 Cook County had 24,404 full-time employees on its payroll. The most immediate problem the incoming administration must resolve is a significant deficit in its General Funds budget for FY2011, which according to some reports will stand at approximately $300 million. One of the candidates for Board President has said the County could face a deficit ranging from $250 million to $500 million. Cook County is a fractured unit of government, with control divided among multiple elected officials and offices. The decentralized governance structure obscures responsibility for decisions, making it difficult for the electorate to hold the appropriate official accountable. The Civic Federation embarked on the Cook County Modernization Project because it believes these problems must be addressed immediately beginning in December of 2010, when a new President of the Cook County Board of Commissioners takes office. The Modernization Project provides a roadmap for creating a government that is more efficient, less costly and more accountable. It contains recommendations that can be implemented in the first 100 days of the new administration, as well as others that will require a more sustained effort. The recommendations included in this roadmap are a mixture of new ideas and previously proposed solutions that have not been implemented by previous County administrations. It is our hope that these recommendations will be implemented by the new administration, and that policymakers and citizens alike will track progress and demand transparency and accountability. The cooperation of elected officials is key to most, if not all, of the major recommendations contained in this document. While the report focuses on all Cook County functions, particular emphasis is paid to improving operational efficiency across Offices under the President, reforming the governance structure and proposing reforms for the Health System. 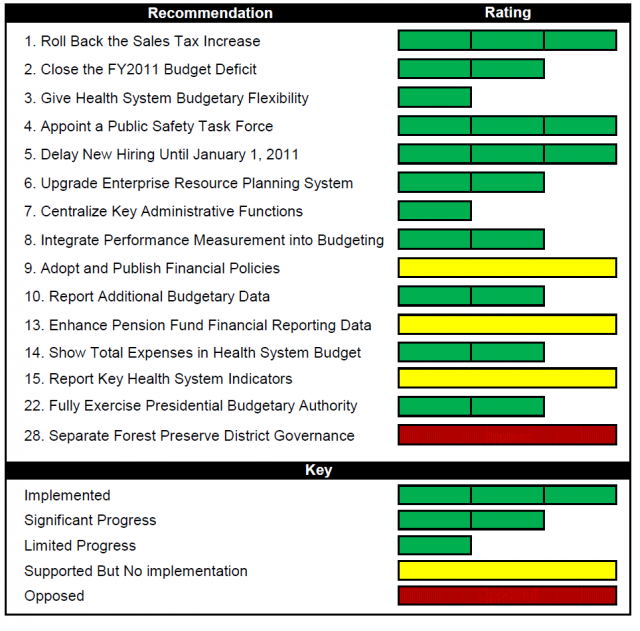 At the conclusion of the 100 day period, the Civic Federation will survey changes made to assess if reform is underway. Cook County government should end the subsidy to unincorporated residents by transferring its services to neighboring municipalities or creating Special Service Areas.